I’ve been looking into the way of Eastern Lightning for some time now. By reading Almighty God’s words and watching The Church of Almighty God’s gospel films and videos, I’ve learned about the purpose of God’s three stages of work, the mysteries of God’s incarnations, the significance of God taking on a different name in each age, the inside story of the Bible, what a wise virgin is and what a foolish virgin is, what truly being raptured is, how God’s judgment of the last days cleanses, transforms, and perfects people, plus what people’s destinations and outcomes will be. I’ve come to understand so many truths I never did before and my faith and love for God have been restored. I’ve had a lot of spiritual enjoyment. I’ve seen that Almighty God’s words are the truth; they possess authority and might and couldn’t be uttered by a human being. They are utterances that come from the Holy Spirit. I feel that Eastern Lightning must be the true way. However, some of the pastors and elders in religious circles say that if it were the true way, why would it be so suppressed, persecuted, and condemned by the CCP? I’m not clear on this and want to do more seeking. The understanding and experience you’ve gained from reading Almighty God’s words is entirely the Holy Spirit’s enlightenment and guidance—thanks be to God! But if we can’t see the CCP government’s essence of resisting God and being an enemy of the truth, we get confused when we hear the pastors and elders say things like that—that’s perfectly normal. The Lord Jesus once said, “Ask, and it shall be given you; seek, and you shall find; knock, and it shall be opened to you” (Matthew 7:7). God is trustworthy, so as long as we genuinely seek He will enlighten and guide us so that we can understand the truth, and then the issue can be resolved. Below I’ve shared fellowship on our understanding of this confusion of yours; I hope it can help you. 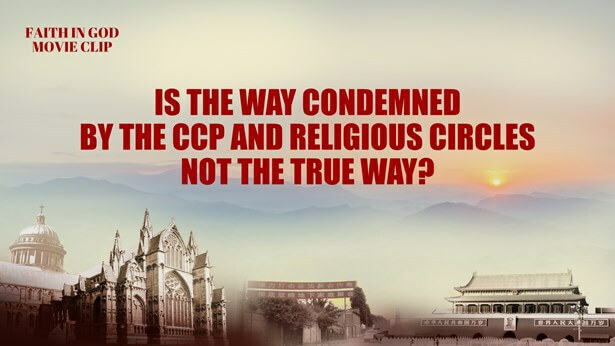 Most pastors and elders in religious circles say things like, “If Eastern Lightning were the true way, why would it be so oppressed, persecuted, and condemned by the CCP government?” What they mean by that is that if it were the true way, the Chinese government wouldn’t do these things. Is this perspective in line with the truth, or in line with the facts of God’s work? Think back to when the Lord Jesus had just come into the world. King Herod heard from three wise men in the East that King of the Jews had been born. He was very afraid and unsettled, in fear that his throne would be taken from him, so he ordered that all male children within the vicinity of Bethlehem under two years of age should be slaughtered. And when the Lord Jesus appeared and began working, the Pharisees saw more and more of the Jewish believers were following Him, and out of fear for their status and living, they had Jesus arrested and sent him to the Roman prefect, Pilate. Pilate knew that the Lord Jesus hadn’t committed any crimes, but wanting to maintain his own rule and status, he cooperated with the Pharisees to have Jesus nailed to the cross. Clearly, those in power only treasure status and power; they have no love for the truth. Their essence is of hating God and the truth. From the time the Lord Jesus was born to when He officially began His work, He constantly suffered the condemnation and oppression of the ruling party and the Jewish leaders. Even His apostles and disciples were madly condemned, arrested, persecuted, and even martyred by the rulers and Pharisees when they were spreading the gospel of the heavenly kingdom. But now who would dare say that the Lord Jesus wasn’t the true God, that His work wasn’t the true way? Based on the outlook of the religious pastors and elders, shouldn’t the Lord Jesus’ work also be condemned? So, this speculation of theirs doesn’t remotely hold water and is nothing but a human notion and imagining. It runs entirely contrary to the truth and to God’s work—it’s an absurd viewpoint. So then if Eastern Lightning is the true way, why is it so condemned and persecuted by the CCP government? This is directly related to its demonic essence of opposing God. It’s common knowledge that the CCP is a satanic regime that most hates the truth and opposes God. It even refers to itself as a specter that haunted Europe and later developed into the evil theory of communism. It makes those who are blinded and corrupted by it deny and resist God, and take the evil path of “fighting with the heavens, with the earth, with man.” It’s evident that the CCP is a genuine devil; it is Satan. Its actions since coming into power in 1949 clearly reveal its demonic essence. It influences people over time with textbooks, and famous people’s thoughts and speeches so that the Chinese people have become inculcated with heresies and fallacies like atheism, materialism, the theory of evolution, and Marxism-Leninism. It forcefully brainwashes people so that they don’t believe in God’s existence or that man was created by God, and they particularly don’t believe that God is always sustaining and nurturing mankind, and ruling over our fates. Instead, the CCP has people worship and follow it and sing its praises. On top of that, in order to consolidate its atheistic dictatorship, it persecutes religious beliefs, and madly oppresses and arrests Christians, no holds barred. Ever since its early days in power, the CCP has severely cracked down on religious beliefs, banning and shutting down churches and defining Christianity as an evil religion. Countless copies of the Bible have been confiscated and destroyed, and many Western missionaries have been kicked out of the country, or even arrested or persecuted to death. A number of leaders of house churches have been imprisoned and forced to undergo “reform.” By the late 1970s the CCP made a promise to international society to no longer oppose faiths in an effort to obtain the assistance and support of democratic countries; it added to its constitution that citizens “enjoy freedom of religious belief” and began erecting Three-Self Churches across the country. Although it was waving the flag of freedom of belief to pull the wool over outsiders’ eyes, behind the scenes it never stopped its crazy strikes against and suppression of house churches. It continued arresting and persecuting believers. Over this period of time countless Christians and Catholics were arrested, detained, forced into hard labor, and given sentences. Some were even brutally tortured to the point of disability or death. This is a commonly acknowledged fact both within China and abroad, and there are verifiable cases. So whether something is the true way cannot be considered according to whether a country’s government condemns or oppresses it. Instead, it should be weighed based on the truths expressed and the work done by God incarnate—this is the correct approach. The CCP does not possess the truth, and everything it says and does is contrary to heaven and in opposition to God. It is Satan the devil that hates the truth and resists God and is destined to receive God’s righteous punishment! If we listen to the CCP’s rumors and lies that makes us fools, and not only will we be unable to accept the Lord’s appearance and work, but ultimately we’ll suffer God’s punishment because we have committed evil alongside the CCP. God’s words say, “What is the most basic principle in seeking the true way? You have to look at whether or not there is the work of the Holy Spirit in this way, whether or not these words are the expression of the truth, who is testified to, and what it can bring you. Distinguishing between the true way and the false way requires several aspects of basic knowledge, the most fundamental of which is to tell whether or not there is the work of the Holy Spirit. For the substance of man’s belief in God is the belief in the Spirit of God, and even his belief in God incarnate is because this flesh is the embodiment of the Spirit of God, which means that such belief is still the belief in the Spirit. There are differences between the Spirit and the flesh, but because this flesh comes from the Spirit, and is the Word become flesh, thus what man believes in is still the inherent substance of God. And so, in distinguishing whether or not it is the true way, above all you must look at whether or not there is the work of the Holy Spirit, after which you must look at whether or not there is the truth in this way” (“Only Those Who Know God and His Work Can Satisfy God” in The Word Appears in the Flesh). “To study such a thing is not difficult, but requires each of us to know this truth: He who is God’s incarnation shall hold the substance of God, and He who is God’s incarnation shall hold the expression of God. Since God becomes flesh, He shall bring forth the work He must do, and since God becomes flesh, He shall express what He is, and shall be able to bring the truth to man, bestow life upon man, and show man the way. Flesh that does not contain the substance of God is surely not the incarnate God; of this there is no doubt. To investigate whether it is God’s incarnate flesh, man must determine this from the disposition He expresses and the words He speaks. Which is to say, whether or not it is God’s incarnate flesh, and whether or not it is the true way, must be judged from His substance. And so, in determining[a] whether it is the flesh of God incarnate, the key is to pay attention to His substance (His work, His words, His disposition, and many more), rather than external appearance” (Preface to The Word Appears in the Flesh). Almighty God’s words provide us with the standard for discernment over the true way and false ways. The true way has the work of the Holy Spirit and expressions of the truth. The truths expressed by God provide the sustenance that we need in our lives so that we have a path of practice in all things and even more, our corrupt dispositions can be changed and we can live out the reality that God requires of us. Christ of the last days, Almighty God, has appeared and is working; He has uttered millions of words which are all the truth and have entirely opened up the mysteries of God’s six-thousand-year management plan to save mankind. They allow us to understand how God guided people in their lives in the Age of Law, how the Lord Jesus did the work of redemption of man in the Age of Grace, and now how God judges, chastises, cleanses, and transforms people in the Age of Kingdom. They also reveal all of the mysteries of the truth that we could never before understand, and tell us why God becomes flesh to do His work of salvation and why He takes on different names. They tell us all truths such as how Satan corrupts people and then how God saves people, who God saves and who He eliminates, what mankind’s future destination and outcome will be, how people should seek to achieve full salvation and enter the kingdom of heaven. These truths can thoroughly purify and transform people and they are all what we as corrupt humans need. Through them we can be completely saved by God. Almighty God’s work and words of the last days completely fulfill these prophecies in the Bible: “The time is come that judgment must begin at the house of God” (1 Peter 4:17). “For the Father judges no man, but has committed all judgment to the Son” (John 5:22). “I have yet many things to say to you, but you cannot bear them now. However, when He, the Spirit of truth, is come, He will guide you into all truth: for He shall not speak of Himself; but whatever He shall hear, that shall He speak: and He will show you things to come” (John 16:12–13). On top of that, if it’s the true way it will have the work of the Holy Spirit; no matter how corrupt human beings or any evil forces resist or condemn it, they cannot stop the progression of God’s work. Just like when the Lord Jesus was working in Judea—He suffered the condemnation and oppression of the Roman government and the Jewish religion, but His gospel was still spread to the every corner of the universe and Christian churches were established all over the world. Who now does not know the name of the Lord Jesus? Likewise, Almighty God’s work today is subject to the mad condemnation and oppression of the CCP government, but God’s gospel has still spread across the entire Chinese mainland. This is magnificent and unprecedented, and millions of people have come to the name of Almighty God, and He has gained a group of people who are of one accord with Him. The gospel websites of The Church of Almighty God have been opened up to the entire world; Almighty God’s words have been translated into more than 20 languages and published online so that those who are seeking and investigating the true way from across the globe can read them. More and more, the praises of Almighty God’s name are being sung. Just as the words of Almighty God say, “None can fathom the almightiness of God. In China, a country that regards God as an enemy, God has never ceased His work. Instead, more people have accepted His work and word, for God does all He can to save each and every member of mankind. … The work of God is like mightily surging waves. No one can detain Him, and no one can halt His footsteps” (“God Presides Over the Fate of All Mankind” in The Word Appears in the Flesh). Once we’ve grasped the principles of discerning the true way and false ways and clearly seen the CCP’s demonic essence of hating the truth and resisting God, we will no longer be taken in by the CCP’s rumors and lies. So when faced with Satan’s rumor and fallacies, as long as we maintain a heart of reverence for God, lean on Him, and look to Him and seek the truth, God will enlighten, illuminate, and lead us to understand the truth and see through Satan’s tricks. Sister Yang Guang, that’s it for today’s fellowship—I hope it’s been helpful for you. Please get in touch with us at any time if you have any more questions so we can explore and discuss them. Thank God for His leading! Previous：The Story of Job: Why Did Job Curse the Day of His Birth? Next：Christian Daily Devotional: What Is a Wise Virgin?